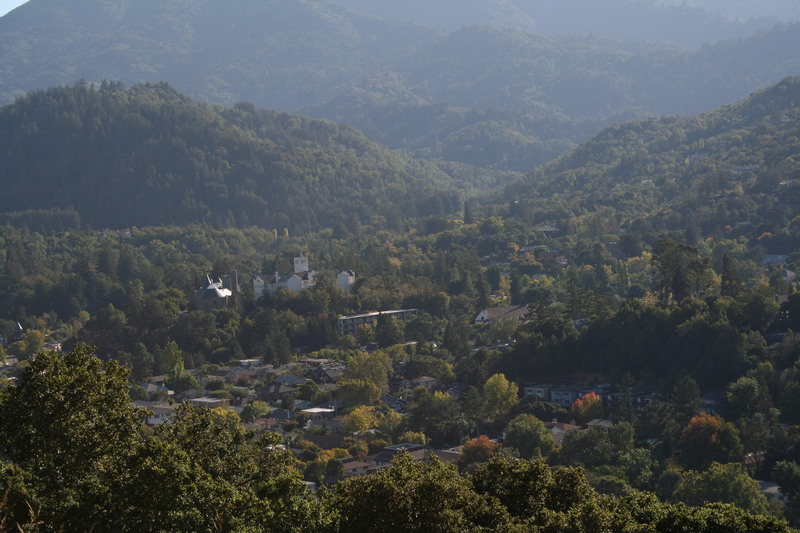 San Anselmo from Red Hill. Photo by the author. Last weekend I had the privilege to attend the annual New Partners for Smart Growth conference in Kansas City. Mayors, activists, councilmembers, and the odd blogger came out to share successes and failures in their communities in the hopes that others could learn from their examples. And after it all, one thing is clear: Marin has it pretty good. Smart growth came about in the early 90s as the response to auto-oriented sprawl. Though it can mean many things, the basic purpose is improving access for walking and bicycling. Within a 15 minute drive is a certain number of residences and businesses. Within a 15 minute walk there is less. In a place with high access for walkers, however, there is too much density for everyone to move around in cars, leading to congestion if that demand isn’t well-managed. Similarly, in a place with high access for cars, there is too little density for people to be able to walk with any efficiency. While there have always been low-density places for the people who want peace and quiet away from the town center, the last 60 years has seen a great proliferation of such places. In cities like Tulsa or Houston, the city centers themselves were transformed to improve automobile access at the expense of walking access. What activists term sprawl was the outward growth of this style. In Marin, we rebelled in the 1960s after we saw what freeways were doing to the rest of the Bay Area. Though our beloved trains and ferries were long gone, destroyed by the Golden Gate Bridge and Highway 101, we refused to allow West Marin to be built over. We developed our landmark Corridors plan, ensuring sprawl would not rule our day. A centerpiece of smart growth is a commercially strong and walkable town, and almost every city and community in Marin has one. These are spaces where you can walk from a nearby neighborhood or park your car once and stroll the strip. They are places with a high density of destinations. They define their community. After all, what would Mill Valley be without Miller Avenue? Or San Rafael without Fourth Street? Other cities aren’t so lucky. But a place where you can walk isn’t much good if you can’t walk anywhere else, or if it’s unsafe to bike around town. On this, too, Marin has a leg up on its peers. Surprising though it is, the fact that we have sidewalks on nearly all but the most rural streets and arterial roads is a rarity, and it shows in the pedestrian fatality rates. Across the US, there are 1.38 pedestrian deaths per 100,000 people. In California, it’s 1.6 per 100,000, but in Marin it’s less than half that. In 2008, Marin only had 0.6 pedestrians die per 100,000 people. Though every death is a tragedy, Marin is doing far better than the country at large. Our focus on smart growth – not to mention the transit-oriented bones left by that rail system – has paid off in how we commute. Our county has the second lowest rate of car commuters in the state, surpassed only by San Francisco. If we add carpools, we are tied with San Mateo County for third. One in three Marin commuters travel by a means other than a single-occupant vehicle. One in ten take transit, third best in the state. That’s not to say Marin doesn’t have its shortcomings. Our bicycle infrastructure is good but not complete. Our zoning codes needlessly inhibit small units and drive up housing costs. And between those walkable town centers are drivable strips, meant more to be sped through than lingered in. But Marin has a lot to teach the rest of the country. I was raised on the Marin sense of pride, the understanding that if only the United States would be more like Marin we’d have a more sustainable, prosperous world. Marinites should smile that the movement towards smart growth around the world is in essence an attempt to take the path Marin took 40 years ago. We should smile, that is, and roll up our sleeves. These ideas had their roots in academia in the 1960s. I agree that Marin is very much the “Smart Growth” ideal of walkable, bikeable communities. But this came about through an organic, democratic and capitalistic means not central planning. It is plain offensive to many of us in Marin to have our communities and transportation to the vision of central planners. Hopefully Marin will wake up before some of the more draconian ideas get implemented. Oh yeah. The smartest growth is the sort that isn’t centrally planned. Market Urbanism and Strong Towns have been important to shaping my belief that a freer market will create better urban outcomes than the distorted market we have now. Interesting links David. I’ll check them out. I am glad you are aware of the coercive, market distortions that are created with central planning that is create without the advice and consent of the people. Even bees have evolved efficient living structures snd societies without a plan. There is no reason to think we cannot either. I actually support walkable/bikeable communities within certain parameters. I have no objection to others living in a more urban environment than me. In fact, I was an urban dweller at several points in my life. I simply object the forced transformation of my community into an urban transit village. Actually, a better link to Strong Towns is at the organization’s blog. Good rundown of their approach to the question at hand. Stephen – great article. I visited the offices of MosProject (http://www.mosproject.ru) – the central government architectural agency that designed most Moscow residential and commercial buildings. The housing in Moscow suburbs is almost the antithesis of Marin with ugly concrete high rises. It also has to be considered that because Marin has made itself a nice place to live (near a large employment center – SF) this has caused property price values to increase. We live in a beautiful area – and yes the current free market system means that you pay more to live in these areas. Imposing concentrations of high density housing to overcome the affordability issue has a negative effect – Marin would become Fremont or San Jose. I’m a fan of the current policy of making 20% of all new Marin housing affordable, while ensuring such building preserves Marin’s quality of life as a beautiful low rise, low density place to live where one is never far from nature and sweeping hills. This approach ensures affordable housing is organically spread, not concentrated which can have negative outcomes – most notably in properties where management does not act responsibly when screening new residents or maintaining a safe property (sadly in a poorly governed a free market system this can happen all too often). I think individuals such as Paul Jensen, planner for San Rafael, deserve immense credit for preserving Marin with policies that prevent over building and serve to accommodate affordability. I find “smart” a loaded term. It’s a red flag for me that someone else’s vision or idea is being imposed. Why else would a product need to be gift-wrapped with such a term – which condescendingly implies “you’d have to be stupid not to want it”? @Steven – great article. It would be simply horrible to see Marin follow the mistaken path of Halle Neustadt that followed such a vision for “smart growth”. Once East Germany became a free market the high density residences were abandoned and suburban growth prevailed. Reminds me of China where I saw immense empty housing developments and tourist resorts built by a central planning agency which were deserted because vision didn’t account for free market reality. (egocentric civic planning). Interesting article. Two questions for the better informed than I: 1) What role did/do Marin’s open-space set asides have in stemming sprawl? and 2) Is there a plan in place on what to do once designated areas are completely built out? Will higher densities in or near town centers be allowed? 1) Quite a bit. It’s meant the hilltops and ridgetops have been largely spared, and MALT has meant West Marin can’t sprawl at all. I’ll defer to those who are more involved in open space issues to elaborate. 2) Not really. Each town has its own zoning codes and general plans. Personally I’d like to see downtown-style development expand through those drivable strips I mentioned. That would add a significant amount of square footage for homes, retail, and office space in a way that is entirely within the character of the town. Fairfax has done that by rezoning all its highway commercial areas as downtown or neighborhood commercial. That said: higher densities don’t necessarily mean new buildings. If the height limit of 32 feet stays in place, as it is in most places, but the density caps and parking minimums are lifted, the older buildings would probably see adaptive re-use, especially if they’re given historical designation. Voltaire/David – your question is way too narrow. Marin’s open-space set asides stemmed sprawl *in Marin County*. But what did they do regionally? By reduction of development in Marin, affordability in Marin County go way down, so what happens? The boilerplate example of this is Boulder Colorado. Boulder very aggressively sought out open space in the 70’s and 80’s, and has locked down the city limits from a housing growth perspective and the place appears pretty nice. However, all this resulted in was that the lesser affluent communities of Louisville and Superior took their big swaths of land right outside of Boulder’s greenbelt and paved it over with rows of me too housing. As a result, Boulder County as a whole is *very* sprawled. Boulder’s transportation system was not designed to deal with the large influx of regional housing and the main roads in central Boulder are choked up all the time. I’m not calling out Marin for doing something wrong – and Marin has definitely had the good fortune to be surrounded by water instead of developable land – but to say that Marin’s lack of housing has not caused sprawl is using tunnel vision. Sprawl is a loaded term for developments where you don’t want to live. If you are seeking better life with a backyard, that “sprawl” is your home. For example, I live in the “sprawl” community that was built 60 years ago in Marinwood-Lucas Valley. It is a lovely neighborhood with mature trees, protected open space and good schools. Now the “planning geniuses” and politicians want to transform it into a Transit Village at densities to approximate Daly City (famously immortalized by the song “Little Boxes”) to fulfill their vain ambitions of Smart Growth. Of course we , “little people” have been excluded from the conversation and are being steam rolled. Developers will profit mightily.The Supervisors will win millions of dollars in Highway Funds and Hud community development funds to build bike paths and other non-essential items. You may see this Smart Growth as a victory. I see it as a Class war on a politically weak community. It violates fundemental rights. All people across the political spectrum are hurt. I don’t see those projects as victories or smart growth, if you’re curious. Stephen – the reason the developers will profit is because there is a demand. You are demonizing the developers but really you are demonizing people who need housing where there is insufficient supply. You deride Daly City but if Daly City did not have it’s current density, what would be the result? Where would those people live? Petaluma? Stockton?